Nom Nom Galaxy.. THE REVIEW! | ZQuestion Reviews? ← PSA! Incoming! NEPTUNIA U! Are you hungry? Will soup do you? Lets take a trip to the Playstation 4. Ready to make that soup and send it off into space on a damn rocket! Come with me.. Because where we are going.. Me and you are going to make some Soup… Also… Nom Nom Nomin on Heavens Dooraaa. If you don’t sing that in your head.. You won’t get it.. Like always.. You do not have to read all of this.. Jump down to the bottom where it says my “Opinion Part of the Review”.. If you know what the hell is going on in the game and just want to see what I think of it.. 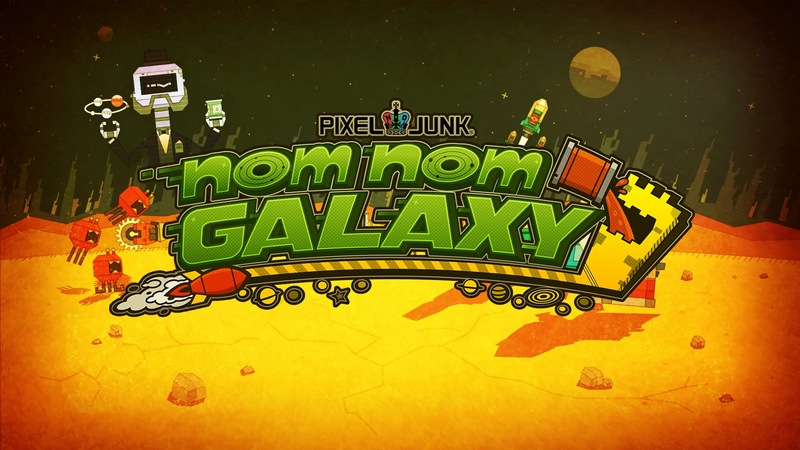 Welcome to the world of “PixelJunk Nom Nom Galaxy”! A game about making soup. First released on the PC last year.. It has recently released on the Almighty PlayStation 4. The idea is simple, Crash land on a planet, build a factory, harvest the wildlife, turn it into soup and shoot it off to space to have more market shares then the competition. You reach 100% by the end of the day and you dominate the soup market! This all sounds easy doesn’t it? Well welcome to Soup Co.. 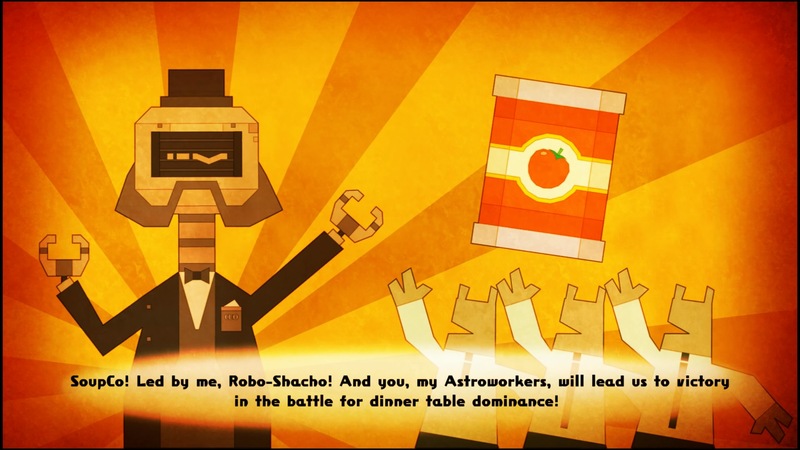 He is Shacho.. You… Are Not Shacho.. Becasue.. He… Is.. Shacho..
Shacho will be your guide for the game. He will guide you slowly through a great opening tutorial planet. He will teach you the basics and even let you build a small factory. Then he throws you into another planet where you will most likely ask yourself.. ” What do i do?”… You will be set up with a factory that is fully working but you must explore around the map to trigger more tutorials of what they are and how things work. So let me give you the basic info about a planet. 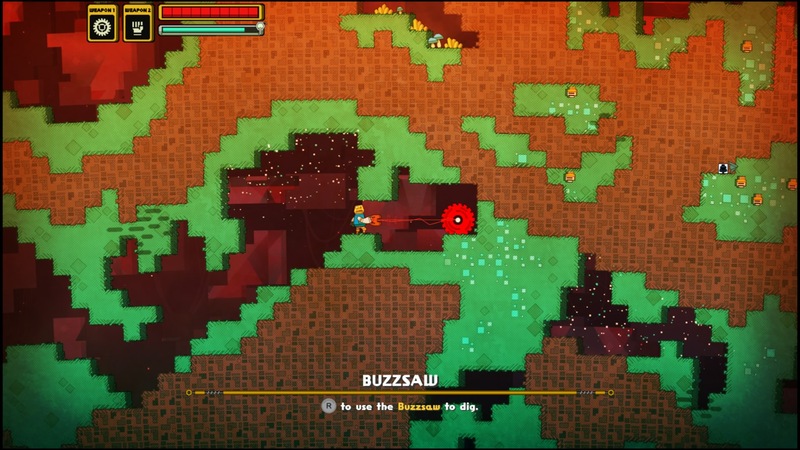 You will be placed on a planet with your trusty Buzzsaw. This saw will break through anything except the redish “rock blocks”. It can be a drill, destroy plants and even kill creatures. Yes you will run into things that will want to kill you if you get close. 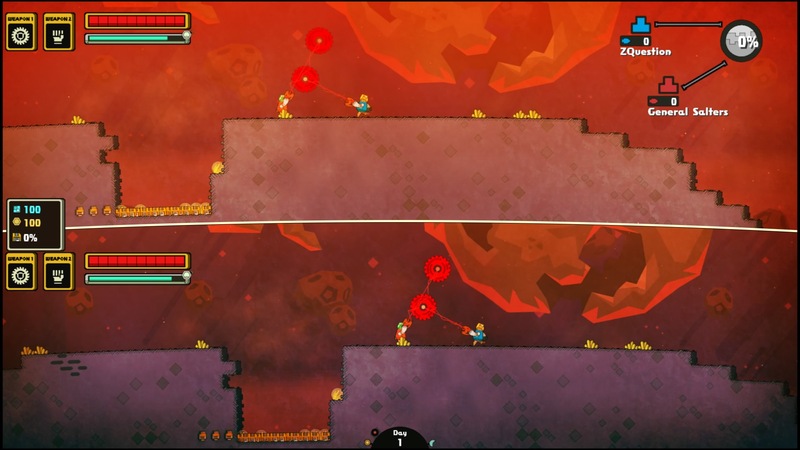 You also have a basic punch attack that does a bit more damage but the buzzsaw is good at distance. Also remember to get some oxygen at times.. You can find this in areas that have a sparkle. Also water can be found and you can swim.. but you will die if you are not careful because you cant hold your breath for long and fish creatures can kill you. If you do die.. No worry.. You just drop some stuff and respawn.. Go back to where you died to collect what is yours! You also can find other weapons on the map at times..
Mining is good for exploring and also finding funds to create and expand the factory.You will get money from soup but you will have to do more then that. You can also find these other blocks that auto trades in for gum once you have 100 or so. Then you can chew gum and get whatever bonus that gum is for.. But I feel like I am jumping way ahead of everything. Just.. Build a factory.. Collect up ingredients.. Put it in the machine.. It makes it and puts the soup into a can.. Put the can into the rocket.. Get shares. Well this is all true but the factory does have some order to it. Like you start off with what is a power station. You must link everything to this so everything else can work. Then you have to watch how much power you are using. So you do not want to overbuild or you will need another power station to power everything. I found that most the time it could power up several stations without getting to the red . So you have everything going.. But that is not all because the rival corporations are a bunch of dicks and will attack you randomly! So you have to build gun towers.. So now it is part tower defense game. They will come in waves and you must stop them from destroying the factory. But don’t worry if it takes some damage because you can repair anything.. Just it cost a little bit. Before you know it.. It will be the end of the day and you will get a score. Games can go on for weeks.. You just need to get a 100% share and it will be over. Or you can always back out after a first day and see if you can go work on another planet.. It saves.. It saves..
Again.. This game is all about soup and while you travel around and find new ingredients.. You mix and match.. You will come up with new recipes that will have more or less value. 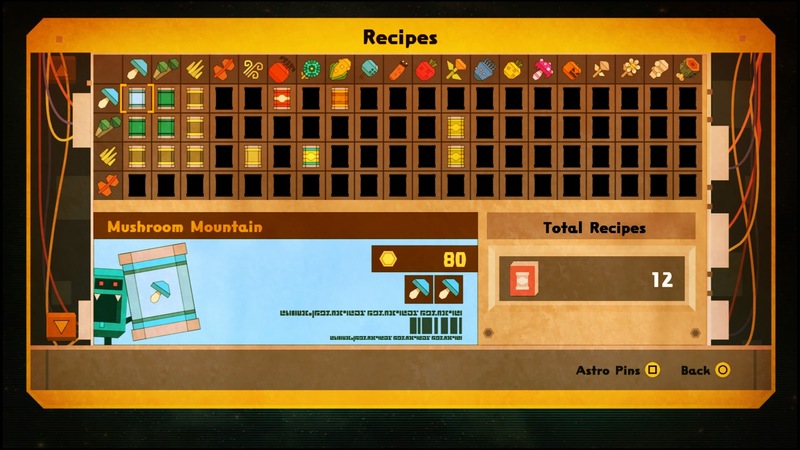 The more recipes you find, more planets will unlock. Then you can explore them to find more rare ingredients to make more soup! 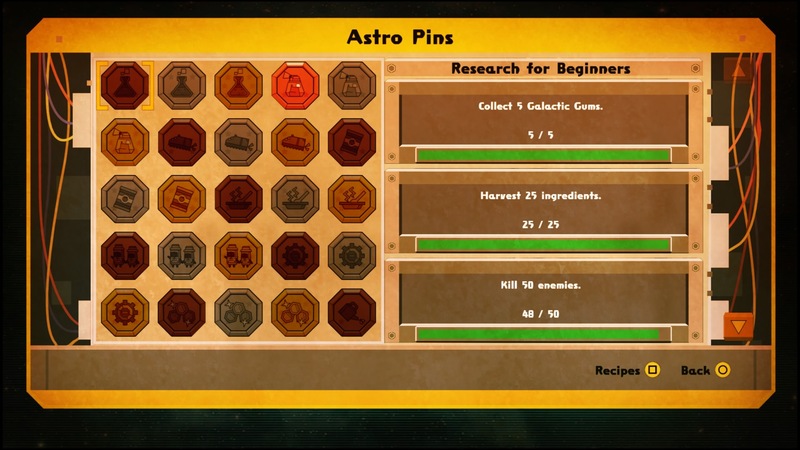 Astro Pins are another thing you will see displayed at the bottom of the screen time to time.. They are mini mission/challenges/stat collections. These will also unlock gum time to time and just add a bit more insensitive to the game. Research is another way to unlock more items for the player and factory parts. 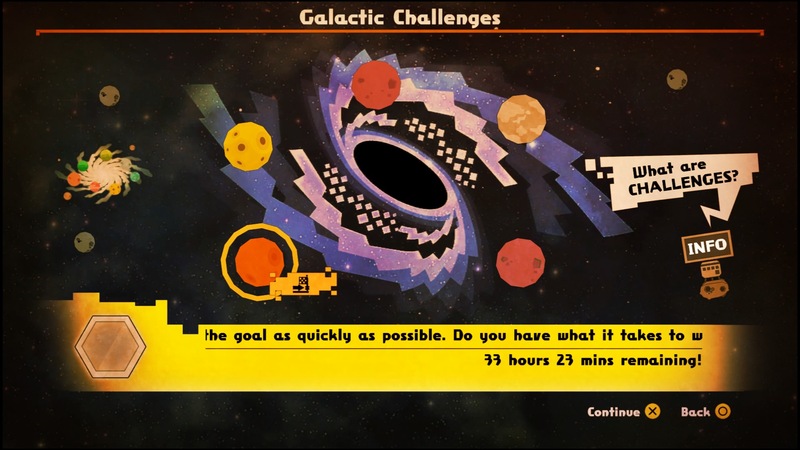 And if you do not care to run a factory… You can always play Galactic Challenge mode. Each planet has a different event to play. From Racing, Hunting or just factory building. Get it done and get a time/score.. See who is the best on your friends list and the world. You can even earn medals..
Or if you have friends.. you can jump in and help them out.. Or if your friends are around you.. Split SCREEN! Yes Yes Yes.. This has local co-op and this can be a good thing to have if one wants to explore for ingredients while the other is watching the factory. I think you can have up to 4 player co-op. Well. I guess we should get to the opinion part.. THE OPINION PART OF THE REVIEW! Nom Nom Galaxy has a lot going on. The graphics are simple but work great for the game. 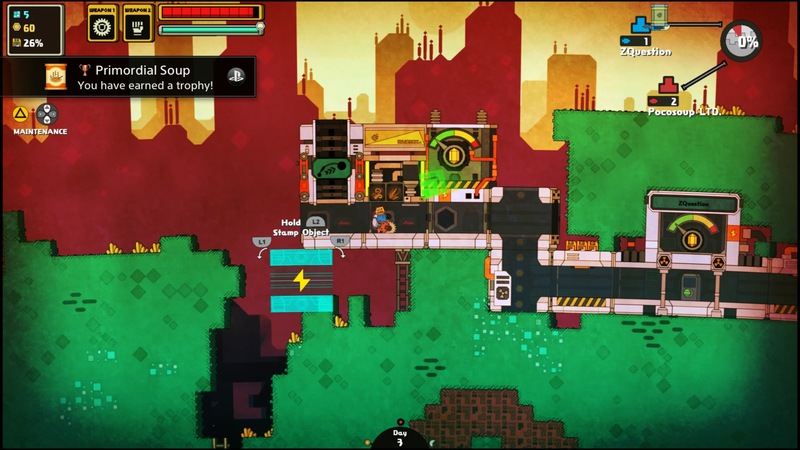 It has that PixelJunk style that you expect. The background sounds and music is solid. Controls are solid and everything seems to be mapped fine. The PS4 Release also works fine with remote play if you rather play it on the Vita. My only complaint is.. The learning curve.. This is a game that starts off with a good tutorial that just becomes disjointed in the second half. In the first hour you will have fun but then find yourself confused on what you need to do and this might turn some people off. Hell I had to take a break and jump back in to really get it. Once I figured out everything, I started to really enjoy it. True Story.. At one point, I almost gave up on this game. Until I actually watched someone in my house play and then it suddenly started to click. I let them restart the tutorials and play for about two hours. They fell in love with the game so much that they wanted to go ahead and buy it.. I ended up buying it for them after they got done playing. The game seems to have a bunch to do. From over 100 recipes to unlock and tons of planets to explore and build on. You also get another mode to try once you have a 100% market share for the planet. The game is packed to keep you busy for a long time. So how do I feel… Well I like the game but I will tell anyone.. Watch some gameplay first.. See if this is a game for you. I really do wish a demo was released for it. This seems to be a true gem for the PlayStation 4 that some might overlook. It might look scary but give it time.. It will find a way into the gaming heart. 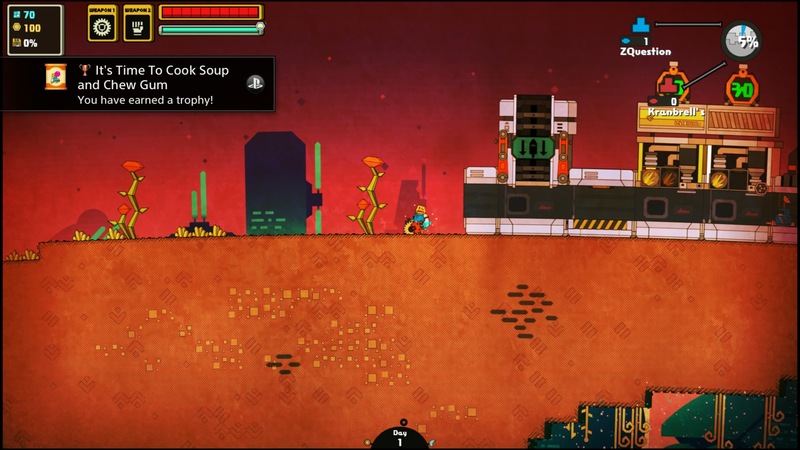 Nom Nom Galaxy for the PS4 is out NOW! 14.99 on the PlayStation Network. Disclosure! The Nice people at Double11 was nice enough to provide a review code. Nice of them. Posted on May 18, 2015, in REVIEWS! 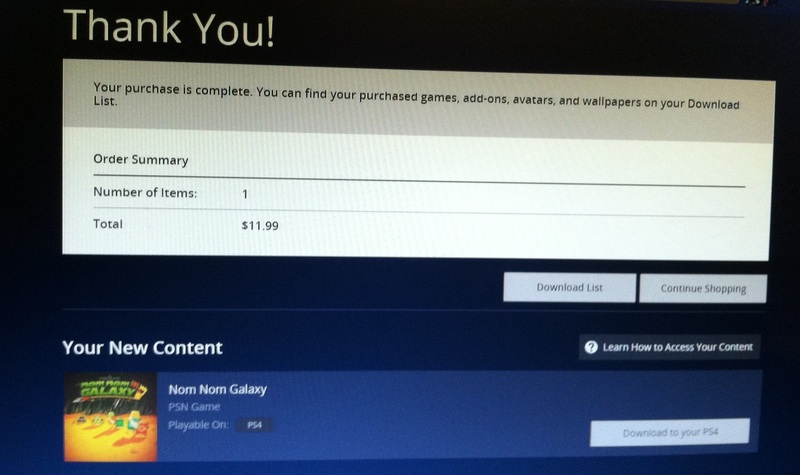 and tagged Nom Nom Galaxy, Pixel Junk, PixelJunk, PlayStation, PS3, PS4, Video Games. Bookmark the permalink. Leave a comment.